If you read Inhabitat, you probably know that we’re big fans of green transportation, but we do think it’s important to see the bigger picture when it comes to electric cars. A new finding from the University of Tennessee, Knoxville shows that electric cars in China have a higher impact on pollution than gasoline vehicles due to the fact that they draw power from the grid (which in China is powered 90% by fossil fuels). We should point out that this study only examined EVs in one part of the world – China – but there is a bigger picture to look at which is the fact that in order for electric cars to eventually become truly sustainable, we need to move towards ultimately powering them with renewable resources. Chris Cherry, assistant professor in civil and environmental engineering, and graduate student Shuguang Ji, analyzed the emissions and environmental health impacts of five vehicle technologies in 34 major Chinese cities. Cherry and his team concluded that when focusing on dangerous fine particles, electric cars cause more overall harmful particulate matter pollution than gasoline cars. Particulate matter is generated through the combustion of fossil fuels and can also include acids, organic chemicals, metals, and soil or dust particles. Electric cars are seen as being more environmentally friendly because they do not have emissions when they are being driven. But for electric vehicles, combustion emissions occur where electricity is generated rather than where the vehicle is used. The problem that the researches discovered is that in China, nearly 90 percent of electricity production is from fossil fuels, and about 70 percent of that is from coal. According to their findings, the power generated in China to operate electric vehicles emits fine particles at a much higher rate than gasoline vehicles, but since the power plants that generate the power are located away from population centers, people breathe in the emissions at a lower rate than they do emissions from conventional vehicles. This doesn’t discount the fact that the pollution is still there. “The study emphasizes that electric vehicles are attractive if they are powered by a clean energy source,” Cherry said. “In China and elsewhere, it is important to focus on deploying electric vehicles in cities with cleaner electricity generation and focusing on improving emissions controls in higher polluting power sectors.” The takeaway here is that rather than rely on coal to generate the electricity to power the growing number of electric cars, we need to focus on developing “greener” plants that get their energy from natural resources like the sun and wind. China's solar industry will be building hundreds of thousands of consumer owned solar rooftops to alleviate the problem. They will be riding around using the free energy of natural sunshine many years ahead of most other countries. Germany also is building a solar infrastructure (much of it consumer owned) for the superior engineered electric vehicles. Do a simple search on this fact. Both countries have put tens of thousands to work installing these systems. The oil/dirty energy money of the US monopolies will continue to buy politicians and media to bog down our ability to achieve similar goals. This is exactly why China has moved forward with aggressive feed in tariff laws and a nationwide consumer owned solar rooftop program (5-15 GW increase). Hundreds of thousands of them will be traveling, using the free energy of natural sunshine, to charge batteries, while the American oil monopoly dollars continue to call our political shots. Jobs? Yes the Chinese solar installation workforce will be very busy for years to come. Their 5 year plan makes our 15-20 year energy plans look pretty ugly. The status quo does not want to change their wealth structure. Even if the electric cars derive power ultimately from coal, it is far easier to deal with emissions from a single source (power plant) rather than the emissions from the thousands of vehicle engines. And the power plant always operates at it's peak efficiency point, whereas vehicle engines are always varying their operating point and rarely operate at their peak efficiency. Coal is terrible for all sorts of reasons, but electric cars automatically incorporate cleaner sources of electricity as they are added to the grid, where a fossil fueled car will only run on that specific fuel. Natural gas is super cheap right now, so we will probably see gas-fired power plants being added to the grid. Natural gas is not an environmental panacea either, but it is far cleaner than coal and will automatically be incorporated into powering electric vehicles. Oh the ignorance! The only way the study's claim could be true would be if petrol appeared by magic in the gas tank of our cars. The cost of pumping, processing and transporting petrol is calculated at about 300-500 mg/km. That is just one of the facts being ignored. Do you thing the only harmful exhaust gas is CO2? Try: Nitrogen dioxide, Sulphur dioxide, Benzene, Formaldehyde, Polycyclic hydrocarbons and Lead. Most important though, with electric cars the pollution site of motoring is shifted to power generation which is constantly having is environmental impact reduced. 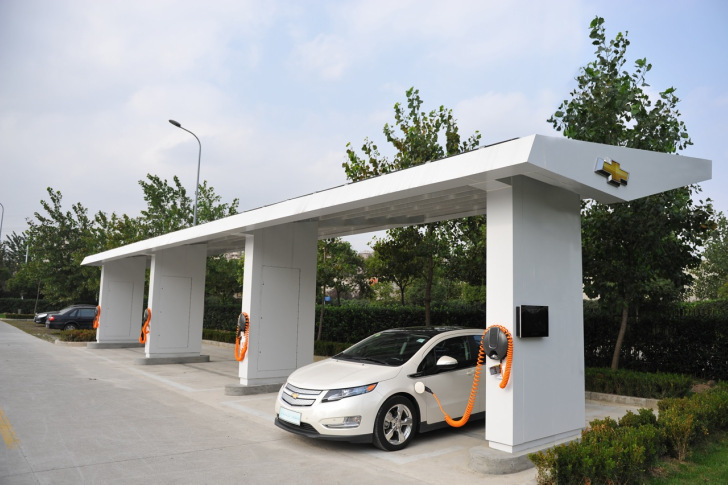 At the size of fleet now circulating in China, there is no need to install additional capacity to power EVs. So the pollution in the form of particulate matter accounted for in this study would still be there with or without EVs. The focus should be shifted away from EVs themselves into power generation. Doing it otherwise is misleading and is an argument playing in favour of oil companies that insist in underplaying the role of EVs towards more sustainable mobility solutions. The title should be "New Study Finds That Electric Cars IN CHINA Can Pollute More Than Their Gasoline Counterparts." If you read Inhabitat, you probably know that we're big fans of green transportation, but we do think it's important to see the bigger picture when it comes to electric cars. A new finding from the University of Tennessee, Knoxville shows that electric cars in China have a higher impact on pollution than gasoline vehicles due to the fact that they draw power from the grid (which in China is powered 90% by fossil fuels). We should point out that this study only examined EVs in one part of the world - China - but there is a bigger picture to look at which is the fact that in order for electric cars to eventually become truly sustainable, we need to move towards ultimately powering them with renewable resources.